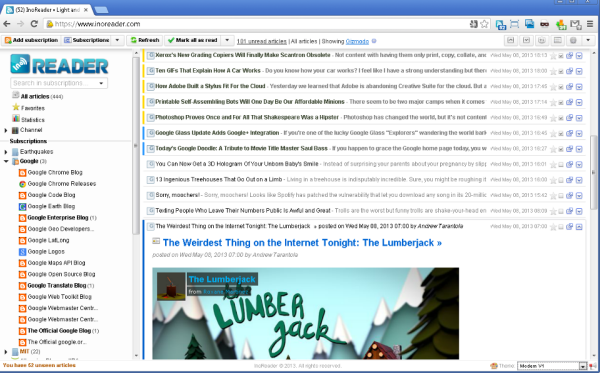 When Google Reader was retired last year, there was a mad frenzy to move all RSS feeds to a suitable alternative. Feedly was the most popular choice for many, but if you like me, just found something lacking with your current RSS Reader, here’s your chance to try another viable alternative. The app in question is called Inoreader and it includes a desktop version, an Android and iOS app, browser extensions and bookmarklets. In this post, we take a look at why Inoreader could just be the RSS Reader you’ve been searching for all along. To get started with Inoreader, you’ll need to create an account, which shouldn’t take long. You can sign up with a unique email ID or just use your Facebook or Google logins. Once you sign in, you’ll be taken to the dashboard where you can search for content to subscribe or import subscriptions from another reader. If you are importing your feeds from another reader, you can choose a default folder location and choose a file or subscribe to OPML subscriptions which let you subscribe to feeds shared by other people on the Internet. If you want to manually add content, just type in a website or paste a URL in the Search box at the top left of the screen. Once you’ve selected the feed, just hit the Subscribe button to add it to the left navigation pane. Inoreader’s top menu lets you mark items as read, view unread items, customize your feed settings, scroll up and down, change the view and theme, view your notifications, and access other preferential settings. The Inoreader dashboard displays all the latest posts, recommended feeds, and a neat list of shortcuts that can make navigating around the app easier. As you can see, building up your feed list in Inoreader is a breeze. The interface is quick and fluid and the recommendation system is brilliant. Inoreader offers plenty of customization options to let you get the best feed reading experience you can possibly hope for. You can choose a high contrast dark theme for night reading, change the view of the feeds to cards if you want to view your feeds in an attractive layout, or go for the classic list view when you want to see more feeds at a glance. There are also options to do more with articles such as adding tags, marking it as unread, voting on it, broadcasting the article with other users who are in your network, adding comments, sharing it on your social networking platforms, or visiting the website. Inoreader also lets you search keywords and subscribe to feeds that match those keywords. The Reader also offers plenty of premium features such as Global Search which lets you search for feeds outside of your subscriptions or access password protected sites. Users can also sort search results by timeline, best matches, age-wise, such as on-date, by week, by month, or by a custom interval. Inoreader also includes a very useful feature that lets you create rules so that you can automate tasks. For instance,when new articles arrive in your Reader, or when they arrive in a particular feed, you can automatically assign certain tasks such as add tags, send it to a specific email address or to Pocket, Instapaper, or Readability. Users can also automate tasks based on specific keyword matches. Inoreader also lets users download articles as PDF files, although this is limited to just 5 weekly downloads in the Free package. Managing subscriptions is also terribly easy. The Preferences section lets you update your profile, customize the interface and behavior of the tool, add, delete, and automate subscriptions, manage rules, folders, tags. build a network, and manage many many more useful features. Inoreader has a lot of good features to its credit; it makes it easy to add new feeds or import them from elsewhere; organize folders and manage them effectively; integrate with popular services; create rules to automate tasks and stay on top of the stories as they happen; make use of powerful search and various sort options; and access all your feeds on your smartphone apps or read them on your browser using extensions or bookmarklets. If you are still looking out for an alternate RSS reader, give Inoreader a try. You may just have found one that suits your requirements.